Imagine a weekend spent a few steps from your own back door – entertaining in your new outdoor kitchen. Guests can relax seated at the stone patio bar, while you cook on the island grill. Dine in style on your bluestone paver patio, encased by raised planter beds constructed with wall stone to grow your own herbs. Lighted stone columns with a winding brick path provide easy access to your separate patio fireplace area. We take a different approach in our outdoor living design and consider the function of the areas while framing views of your yard. We try to utilize the best space for your property layout while complying with township regulations. 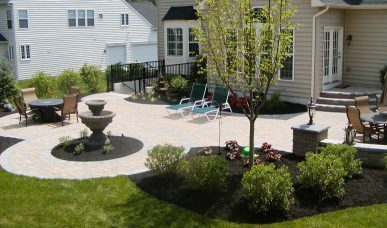 Let us be your patio builder using our high standards, obsessive attention to detail and unique problem solving ability to exceed your expectations. If you can dream it, we can achieve it! 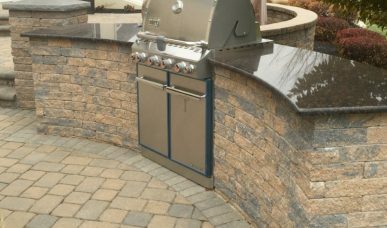 Our experience in everything from custom stone patios and walkways to multi – level patios, allows us to give our customers the best recommendations for a custom-tailored perfect outdoor solution for their homes. Be sure to view our Photo Gallery and our projects to get inspiring ideas! Designed for Ultimate Enjoyment …. 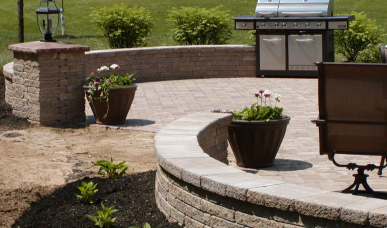 Built to Impress, We Bring Your Outdoor Visions to Life with Scenic Back Patios and Garden Entertaining Spaces. 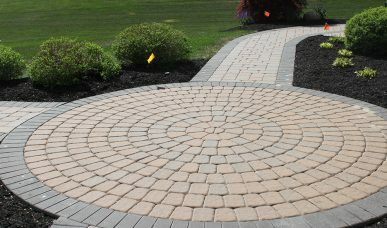 Replace your old broken concrete walkway with a new inviting brick paver walkway, slate walkway or stone path. R&R Caddick uses the highest quality interlocking wall materials and expert workmanship in constructing beautiful retaining walls and decorative walls.